John Ringo is author of the New York Times best-selling series known by most as "The Posleen Wars" comprising A Hymn Before Battle, Gust Front, When the Devil Dances, Hell's Faire, plus the tangential novels Calley's War, Sister Time, and Honor of the Clan (all with Julie Cochrane), and A Watch on the Rhine and Yellow Eyes (both with Tom Kratman). He also co-authored--with David Weber--March Upcountry, March to the Sea, March to the Stars and We Few in the best-selling Prince Roger series. He had visited 23 countries by the time he graduated high school. A veteran of the 82nd Airborne, he brings first-hand knowledge of military operations to his fiction. 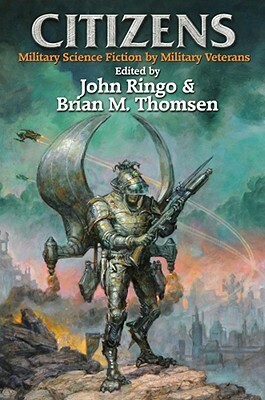 Brian M. Thomsen was an editor at Warner Books (where he was one of the founders of their Questar SF and fantasy line), then later at TSR, and finally did freelance editing for Tor Books. He was nominated for the Hugo Award for best editor, was the author of two novels (Once Around the Realms and The Mage in the Iron Mask), several nonfiction books, over forty short stories, and edited fifteen anthologies. He also served as a World Fantasy Award judge. He died of a heart attack on September 21, 2008.